Many different businesses, both big and small, have started catching onto a new healthy trend - getting their air ducts cleaned. The reasons for this are plentiful, but there are two main ones. By making sure your employees are breathing fresher, cleaner air, you are effectively making sure that they are able to perform much more optimally than they would if they had to cough and choke in a stale, contaminated environment. The aspect of motivation is not to be neglected as well. If your employees are breathing fresh and clean air, a few things will happen. For once, they'll get sick far less often. They'll also feel better throughout their day, and if they'll feel better, they'll be able to enjoy their work environment, which will have a positive effect on their work. If the productivity of your business depends on visiting clientele, then making sure your indoor air quality is at a peak level is crucial. No person wants to step into any business and immediately notice a difference in the air quality. Whether it's a strange, almost imperceptible smell, or a stale and stuffy feeling, the effects will not be positive. On the other hand, if customers step into your establishment and notice a fresh and clean air quality, they'll be far more likely to not only stay there for longer but also to enjoy themselves more, and we don't need to tell you what an important business touchstone customer satisfaction is. Whether you own or manage a bar, a restaurant, an office building or laundromat, professional air duct and HVAC unit cleaning is extremely important. Our professional technicians can rid your ductwork from any debris or contaminants and sanitize the entire system to make sure the air you, your employees and your customers are breathing is pure and fresh. Considering you are running a business, let's talk about money for a moment. 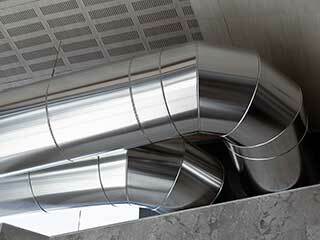 By getting your air ducts routinely cleaned, you'll actually be able to save money on your electricity bills. Your HVAC unit won't have to compensate for any blockages and you'll spend less money on heating or cooling your establishment. We can also repair any damage to the system, and ensure that it stays in an optimal condition. Don't wait until your employees' performance starts to decline and fewer and fewer customers start showing up. Call our experts at Air Duct Cleaning Los Angeles today and we'll make sure your air ducts and HVAC unit are fully optimized.